With my latest aquascape (finally happy ) I have a nice flat area up top about 8" x 14". It's about 8" below the water surface. What are some good corals that love high light and high flow, but grow slowly and/or don't grow tall. I'm guessing most of the SPS's fit my requirements (and I have plenty of light), even though they will eventually require fragging to keep them in the water. I currently only have an encrusting monti up there. I thought acans liked to be placed lower? ooops scratch that then. Don't know a whole lot about them. was just trying to toss out ideas. 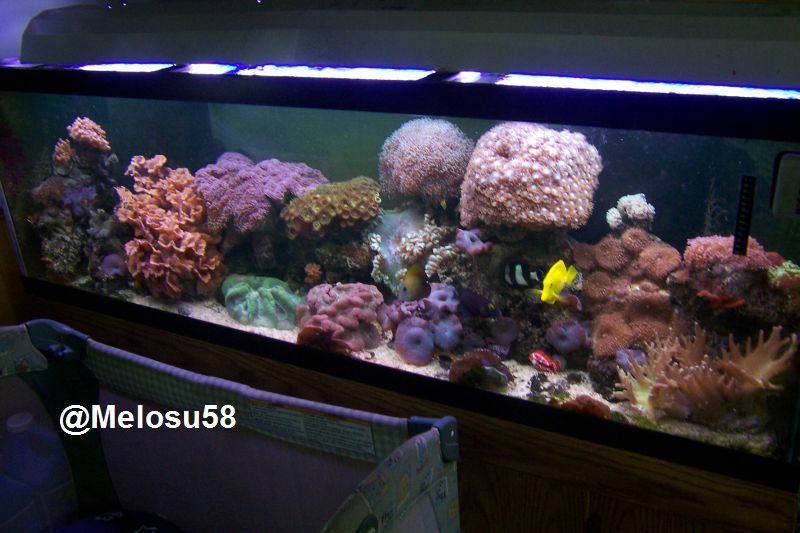 At that water depth and the area you have available I would do a mixture of acropora. In my previous set up (the 72) I had a giant colony of Acropora (scripps acro also known on here as Ziggy's Acro) measuring over 12" across. This colony was growing in conjunction with a Blue Staghorn Acro and 2 other acros with no issues. What I found interesting was how they avoided each other. The Ziggy's acro is a very fast growing SPS and easily overtook the others but never touched them. I had to do some delecate trimming to get them out when I traded the large colony. The one acro I would stay away from is the slimer as it is a very agressive coral and will "slime" those around it as it grows nearer to them.